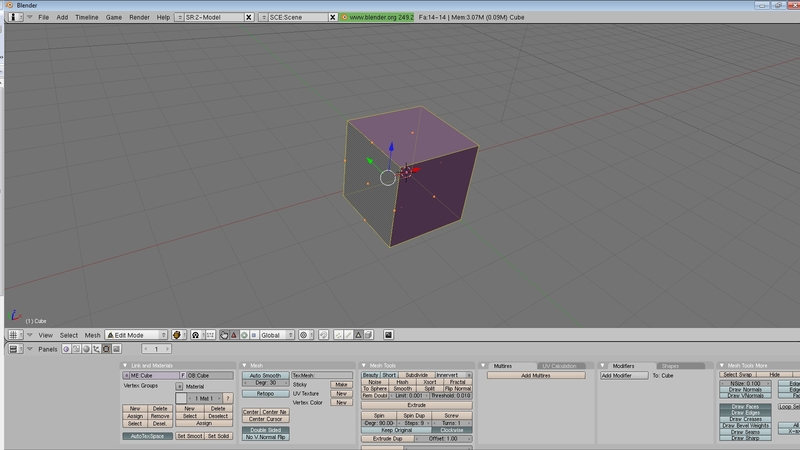 1: Start with the default Blender cube. 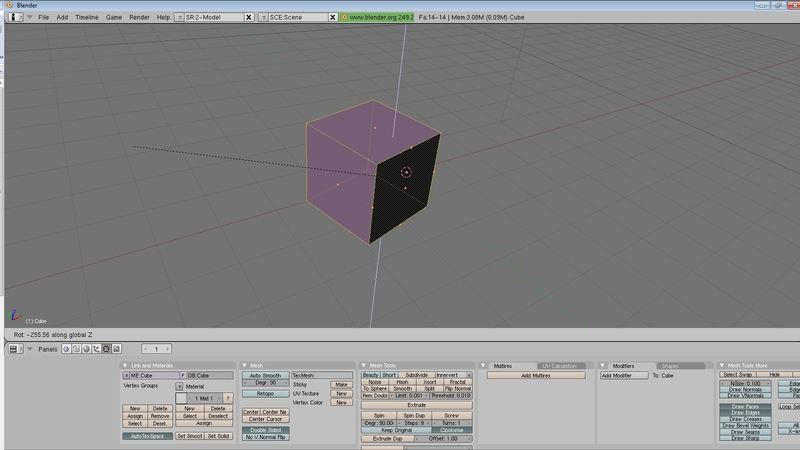 The default cube is 2 x 2 x 2 units in size. 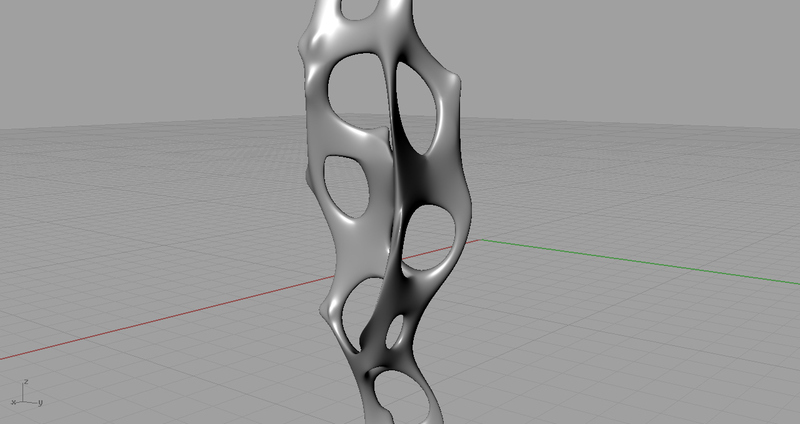 3: Click “R” for Rotate, then “Z” to lock rotation in the Z Axis only. Type “45” to rotate the cube 45 degrees. 4: “A” to select all geometry, them “Shift D” to Duplicate. 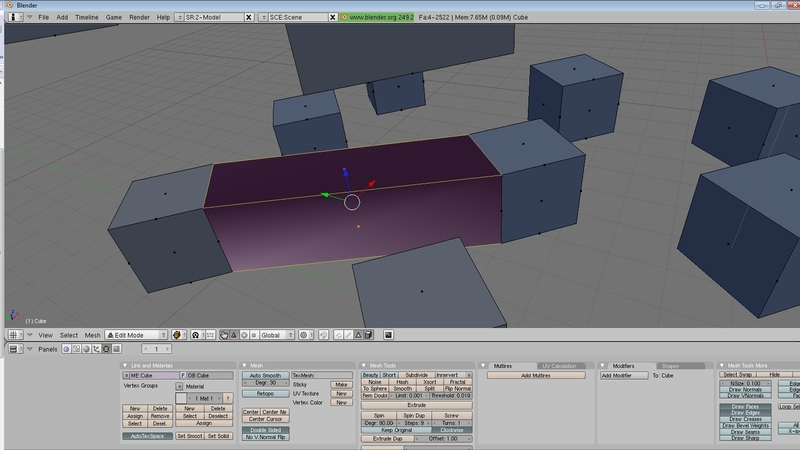 Hit Y to lock movement in the Y-axis. 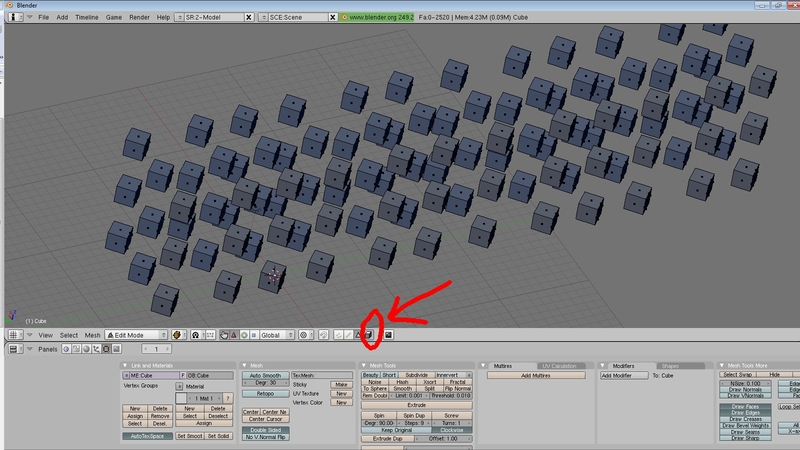 Hit “5” then “Enter” so that the new, duplicated cube is 5 units away from the original cube. 9. You’ll see that the new faces have a weird gradient fill to them. 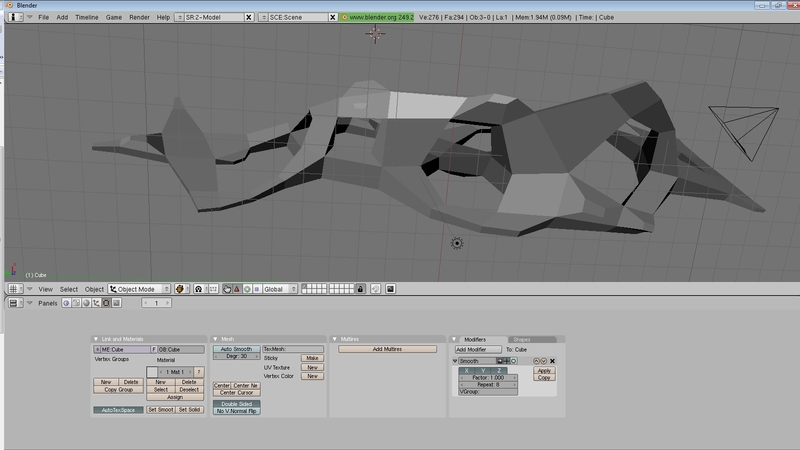 This is because the mesh faces are by default set to “Smooth”. 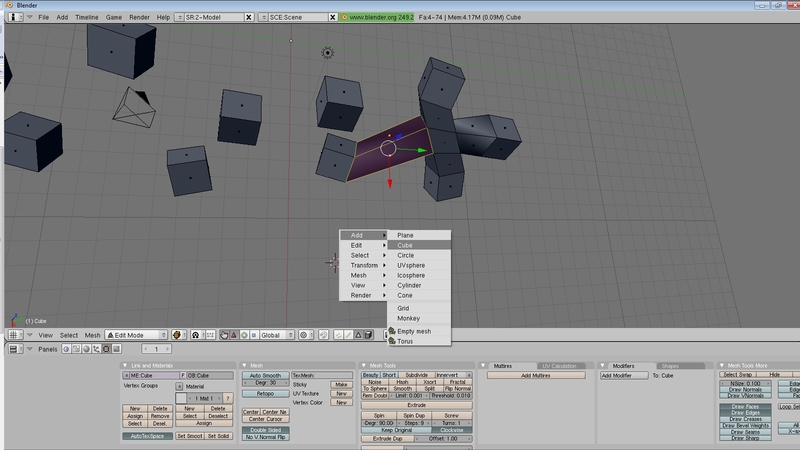 To keep it consistent with the other cubes in the model, we need to set them to “Solid”. To to this, hit the “Spacebar” key -> Edit -> Faces ->Set Solid. You can do this as you create new faces step by step, or you can do it for everything at the end. Either way, you need to make sure the model is consistent, otherwise you’ll run into lemons when we start smoothing the mesh model. Take note, you’ll see what I mean…. 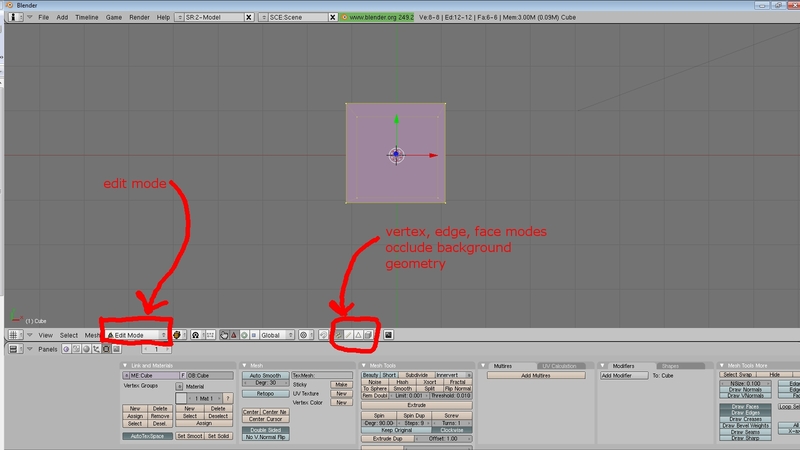 Setting faces 'solid' makes them consistent with the rest of the model. 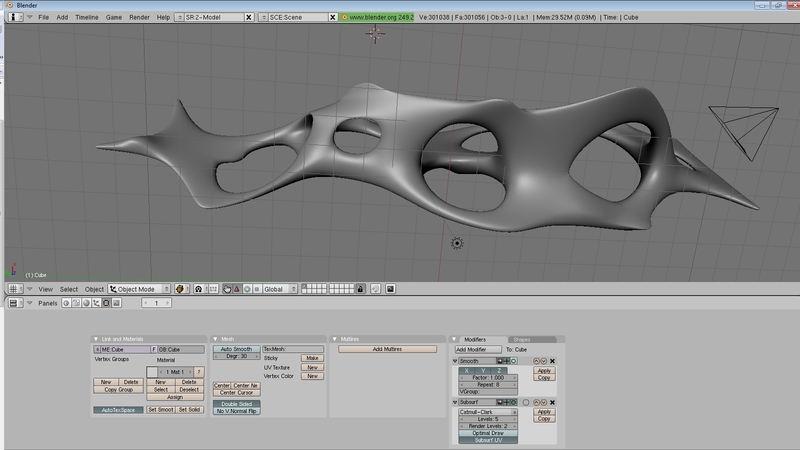 "Spacebar" -> Edit -> "edges" -> "Loop subdivide". 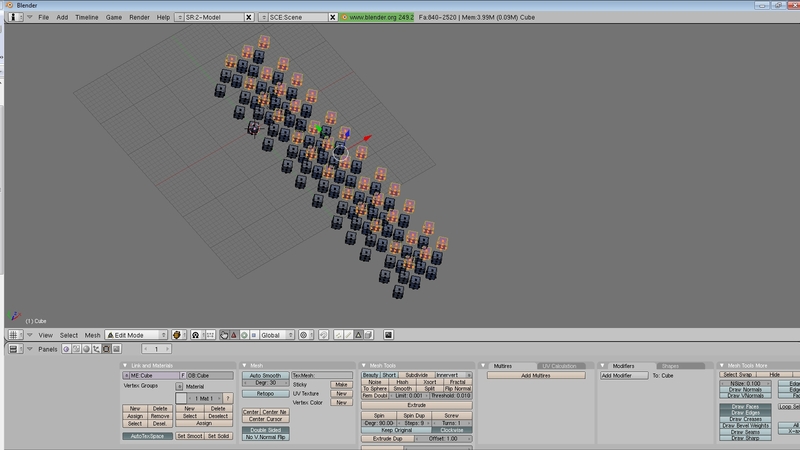 Or just hit "Ctrl R"
12: move the faces “G” for Grab. Or Scale using “S“. Or Rotate using “R“. Or all of the above. You choose. Remember if you want to limit the transformation to a certain axis, hit X, Y or Z while you’re running the Grab/Scale/Rotate. 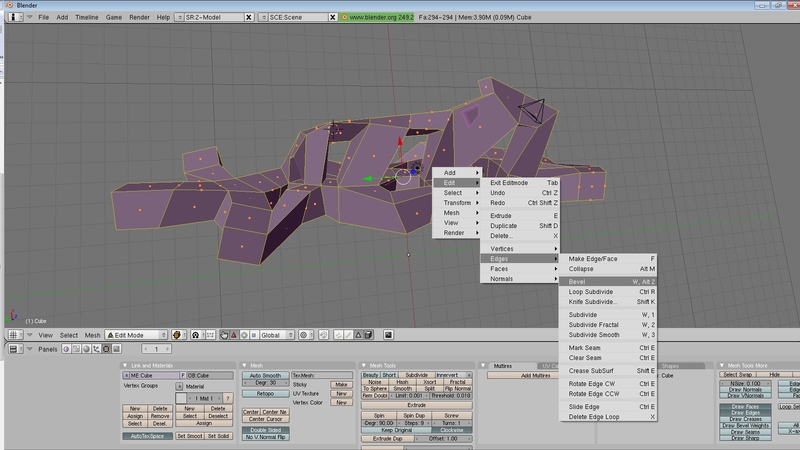 13: Select a face, hit “E” for Extrude. 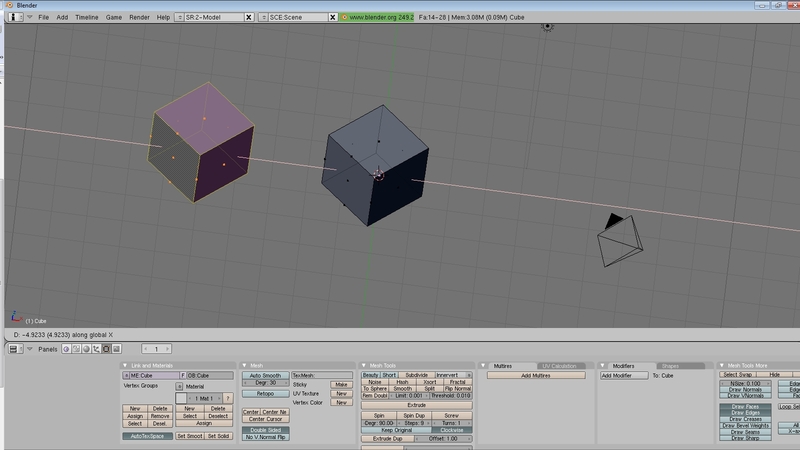 By Default it will extrude in the direction Normal to the surface of the face that you select. What is a ‘Normal’ you ask? Shame on you, didn’t you do year 10 maths? Sigh. Click here for the definition. 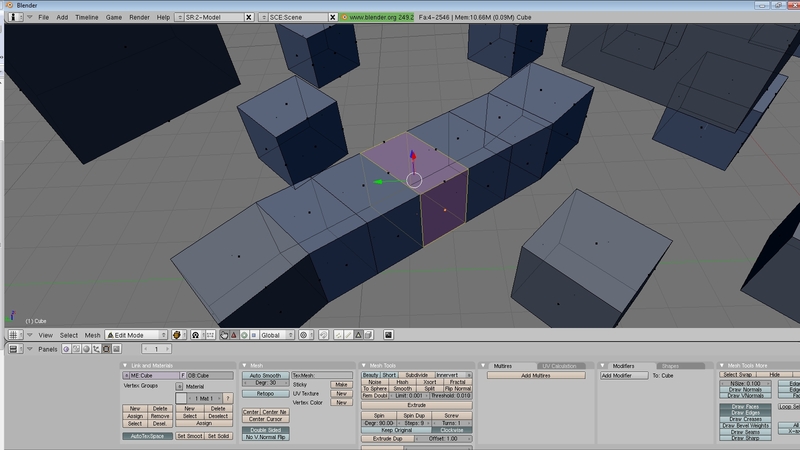 Extruding a face, "E", by default extrudes in the direction normal to the selected surface face. 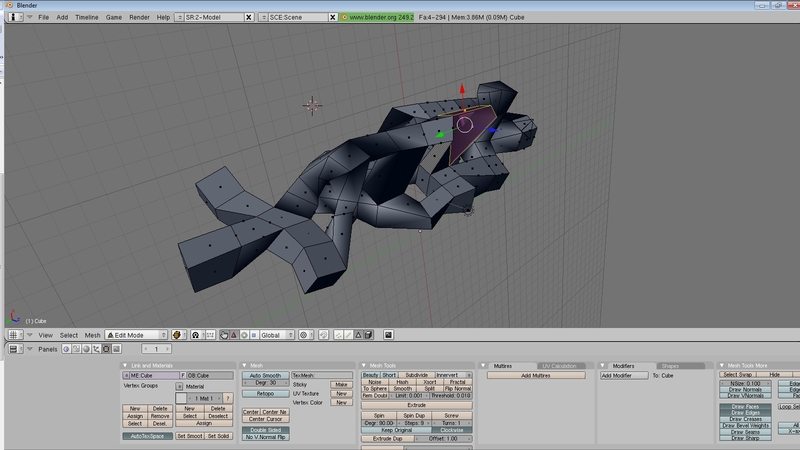 14: Again, to extrude along an axis, hit X/Y/Z. 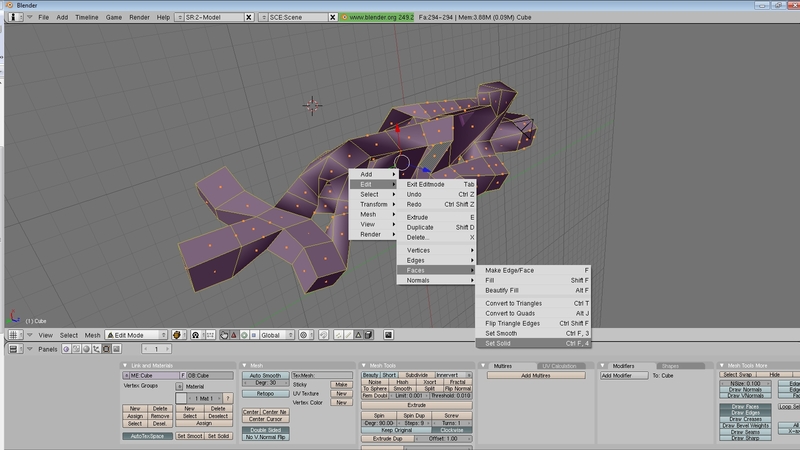 You can also type in a number for the length of the extrusion, or just eyeball it and LMB. “Ctrl R” to split existing faces into more faces. 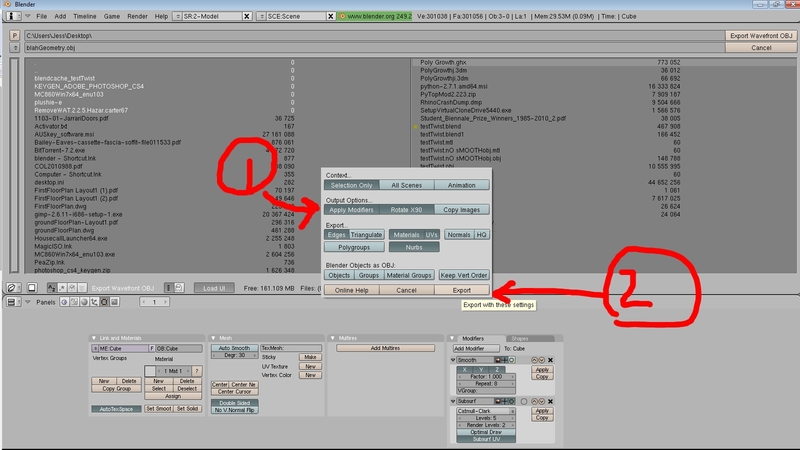 Middle mouse scroll to increase/decrease the number of loop cuts. “G” for Grab. Scale “S“. Rotate “R“. 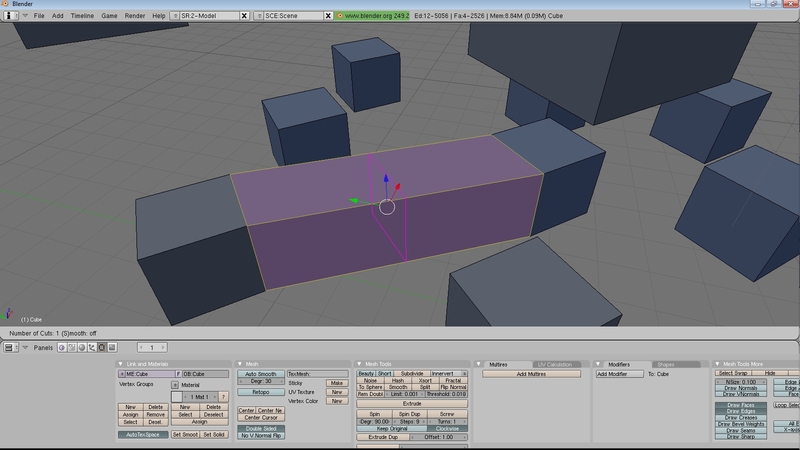 hit X/Y/Z to lock transformation in an axis. Typing numbers gives precise grab/scale/rotate/extrudes. Convert to solid faces: Spacebar -> Edit -> Faces -> Set Solid. 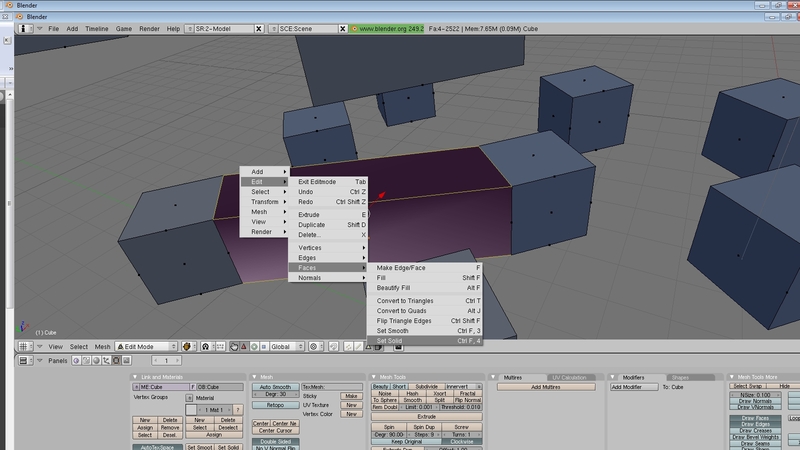 Or "Ctrl, F, 4"
Spacebar -> Edit -> Edges -> Bevel. 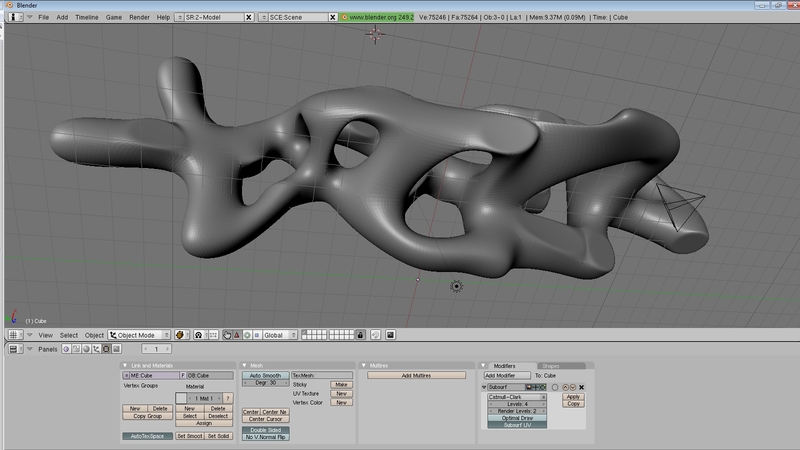 Or "W, Alt, 2"
21: Now we’re going to smooth our geometry, using a Modifier. Click “Add Modifer” -> “Subsrf”. The Default modifer is a “Catmull-Clark” smoothing algorithm, which is a classic surface subdivision smoothing algorithm (click here for wiki info). 22: to make your geometry smoother, increase the “levels”. Level 4 is probably enough, you can take it higher but be warned, your computer may chuck a hissy-fit and crash. 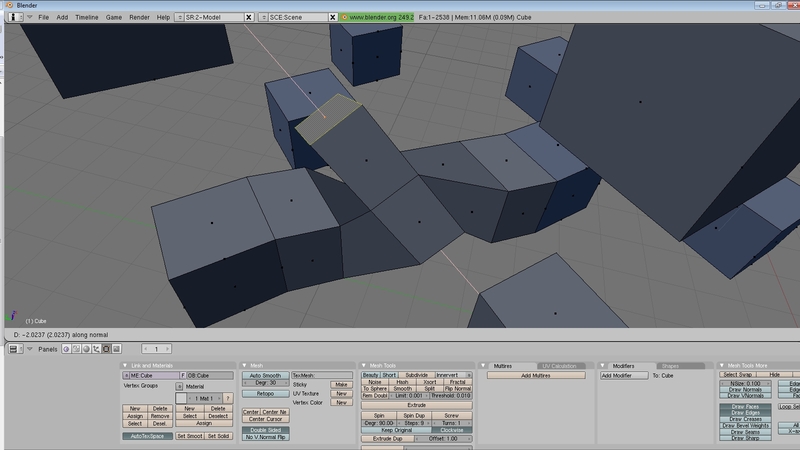 Always good to save your file before doing any smoothing operations. 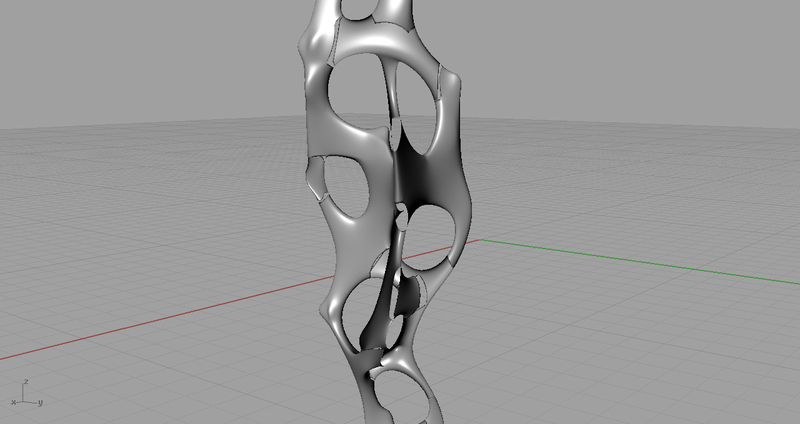 23: If your geometry is looking a bit blob-ugly like it is in this example, you can get some nicer smoothing action by adding a “Smooth” modifer before the “SubSrf” Modifier. 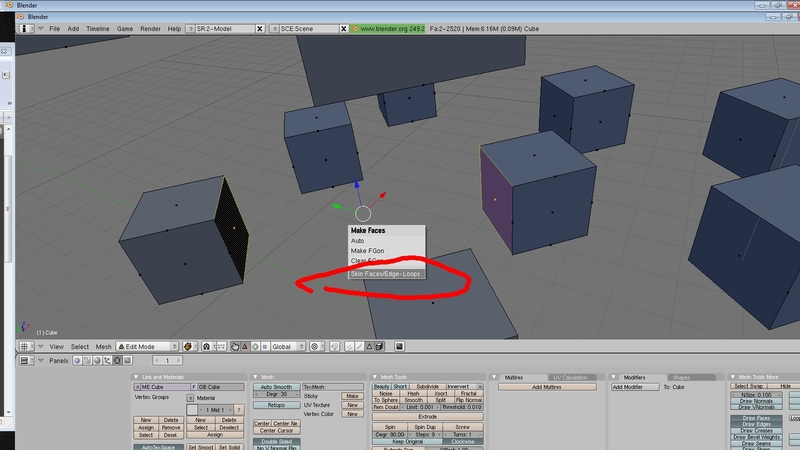 To do this, delete the “SubSrf” we just added (click the little ‘X”) and Add Modifier -> Smooth. Try having a Factor of “1” and Repeat of about “8”. Increasing the number of repeats increases the “relaxation” of your geometry’s vertices. 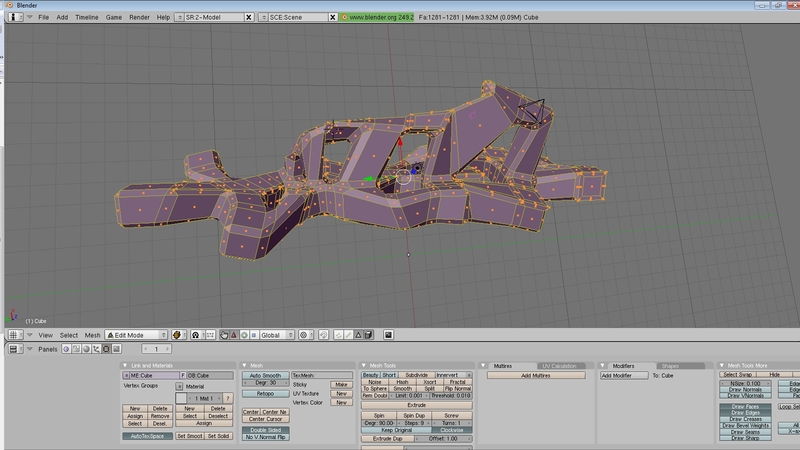 After putting this “Smooth” modifier, add the “SubSrf” Catmull Clark Again. 24. 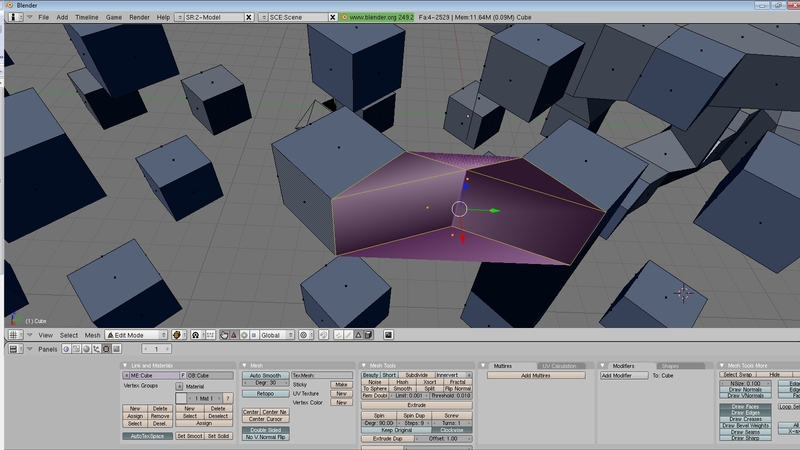 Save your file as a Blender file. 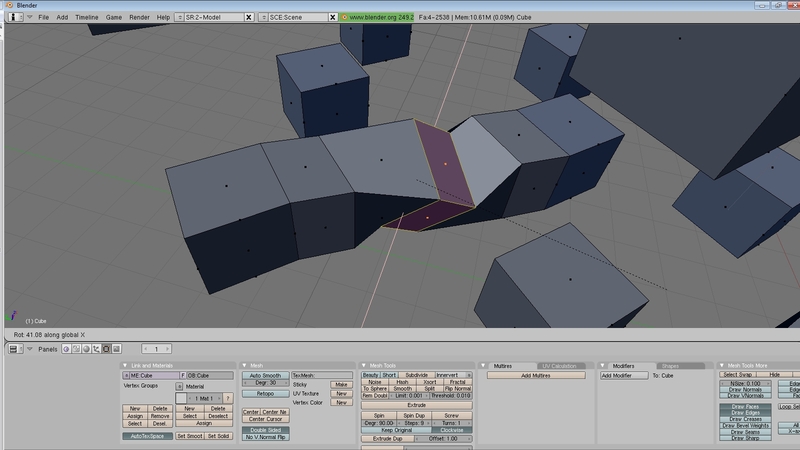 You’ll also need to export your geometry so that we can bring it into Rhino for some more tweaks. 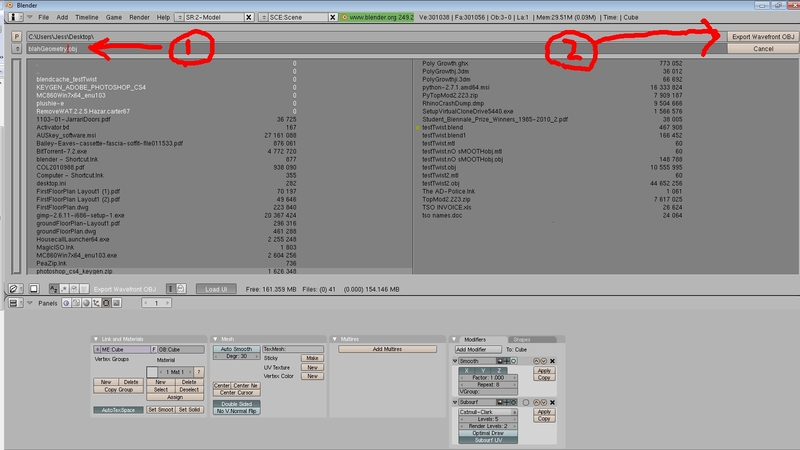 File -> Export-> WavefrontOBJ. 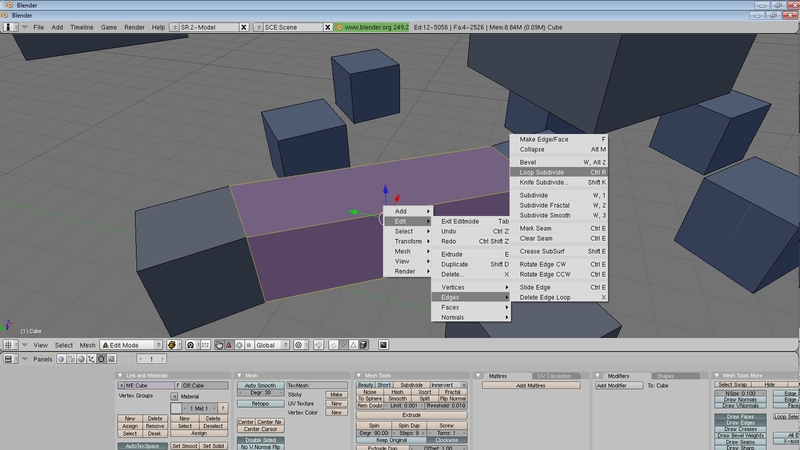 1: Make sure "Apply Modifiers" is selected. 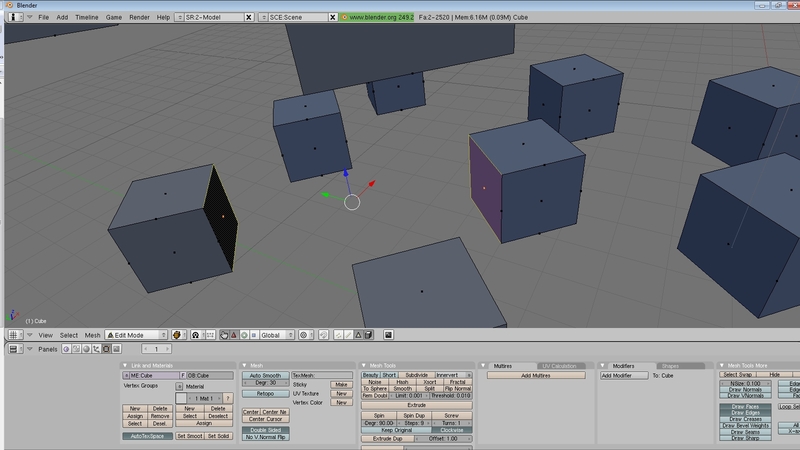 2: Click "Export"
All done in Blender! Lets bring it into Rhino. 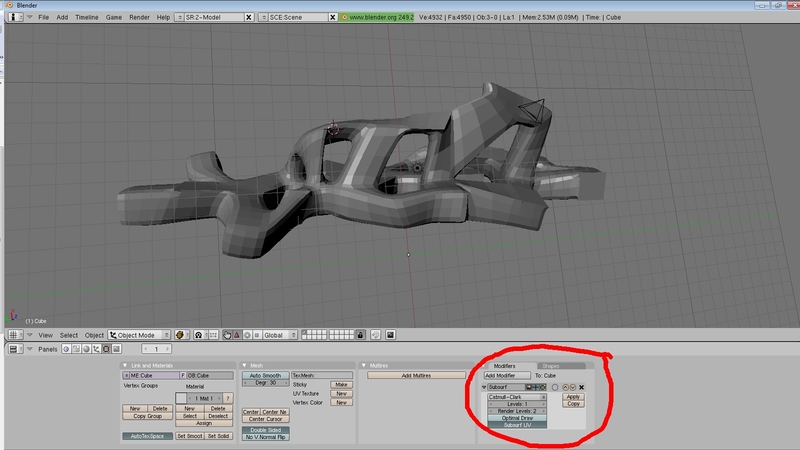 Type “Import”, Check that “Files of Type” is set to “Wavefront OBJ”, locate the file you exported from Blender. 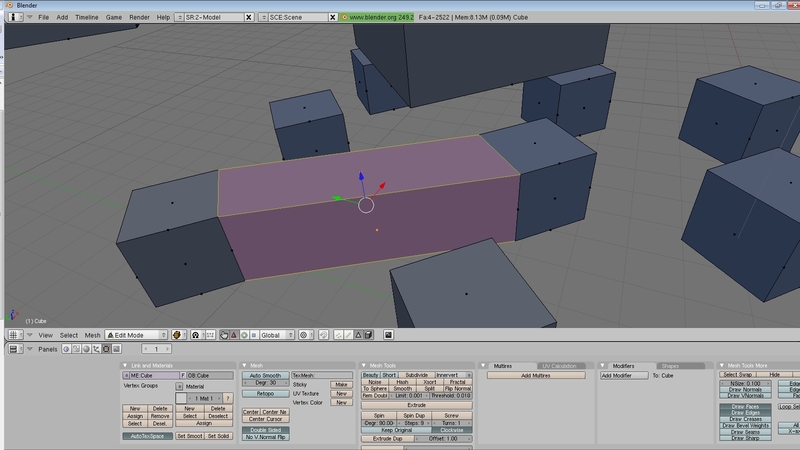 Impoting the OBJ from Blender into Rhino. 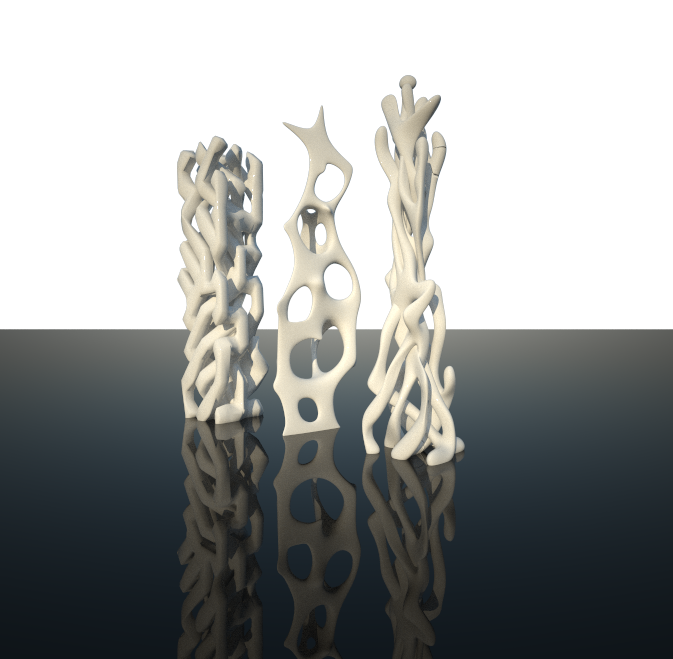 You can see from the Rendered view that it looks like some of the bits are broken. 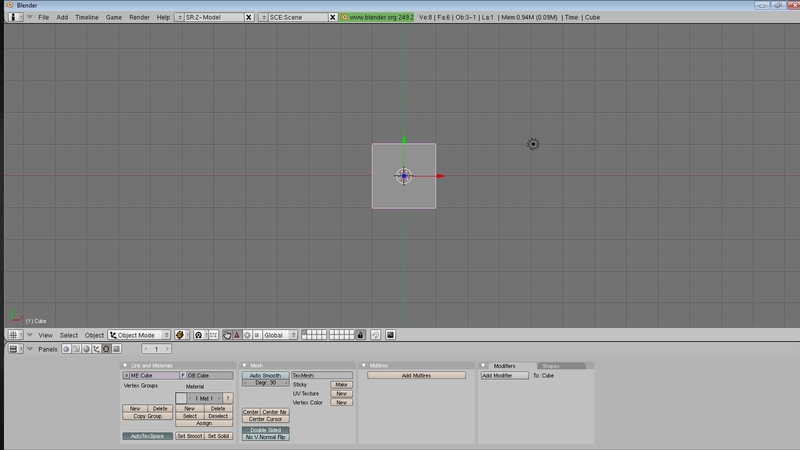 This is because not all the faces of the mesh are orientated the right way. 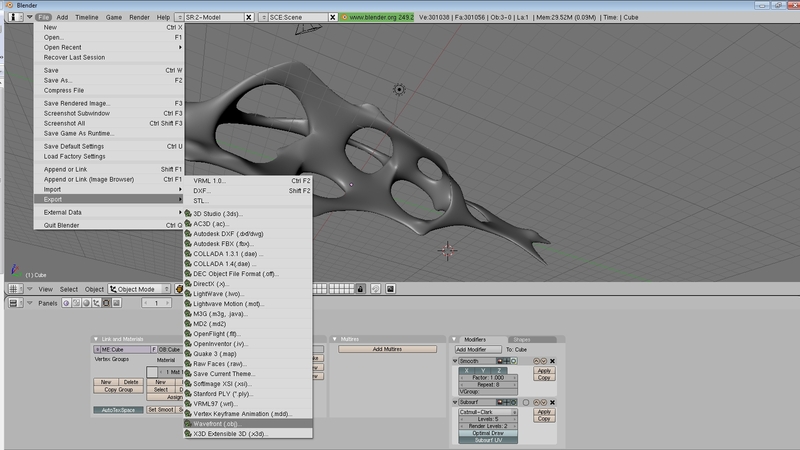 To fix this, select the mesh, type “UnifyMeshNormals”. 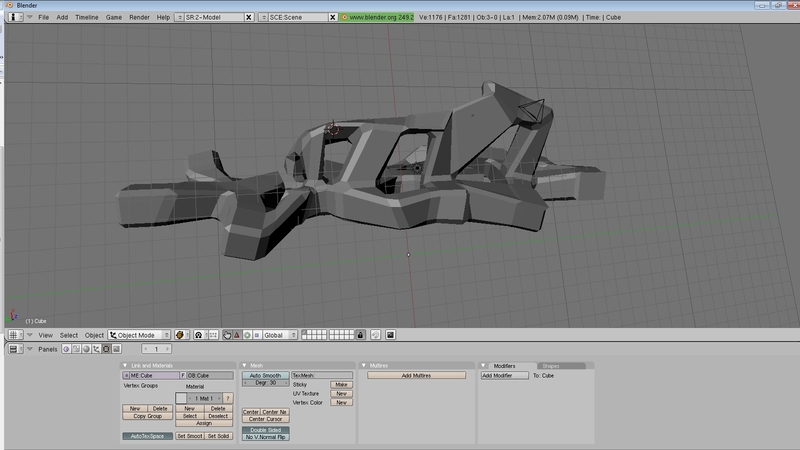 Thats all for now, will go into more next class….